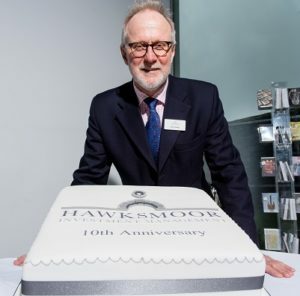 Hawksmoor Investment Management has been celebrating a decade of growth and business success – despite the challenge of launching in the middle of the global financial crisis of 2007/2008. The Private Clients of the company’s Exeter head office were invited to celebrate with Hawksmoor staff at a lunch held at the Royal Albert Memorial Museum in Exeter. They enjoyed a lively presentation from Chief Investment Officer (Private Clients) and Head of Research, Jim Wood-Smith, followed by a private viewing of the museum’s Dartmoor: A Wild and Wondrous Region exhibition, with special insight from curator Tom Cadbury. CEO John Crowley thanked guests for their continued support of the business and explained how he had set out to create a company whose approach to investment management was based on the design principles of the Baroque architect Nicholas Hawksmoor – meaning that the company’s services and products should balance tradition with innovation, be built on reliable and solid foundations, and be imaginative but with disciplined processes. Through this approach, Hawksmoor Investment Management has grown from a single office of two people in Exeter in 2008, to almost 50 employees located in offices in Taunton, Dorchester, Bury St Edmunds and most recently, London. Last year the company achieved the milestone of managing over £1bn of clients’ money, and this month it was included in the Top 50 Fast Growth Businesses in the South West.